Of all the fads and trends in the cycling industry, the touring era that accompanied the 1976 BikeCentennial in the U.S. was probably the most positive. While not everyone wants or needs a touring bike – a touring bike is a bike that can work well for all kinds of riding. And, due to economic conditions during this era – favorable exchange rates for the Japanese yen and the oil crisis of the early 70’s – the U.S. market was flooded with low cost, high quality touring bikes in the mid 70’s to mid 80’s. These bikes often survive intact, as they were quite well made to begin with, and were usually equipped with top of the line components. 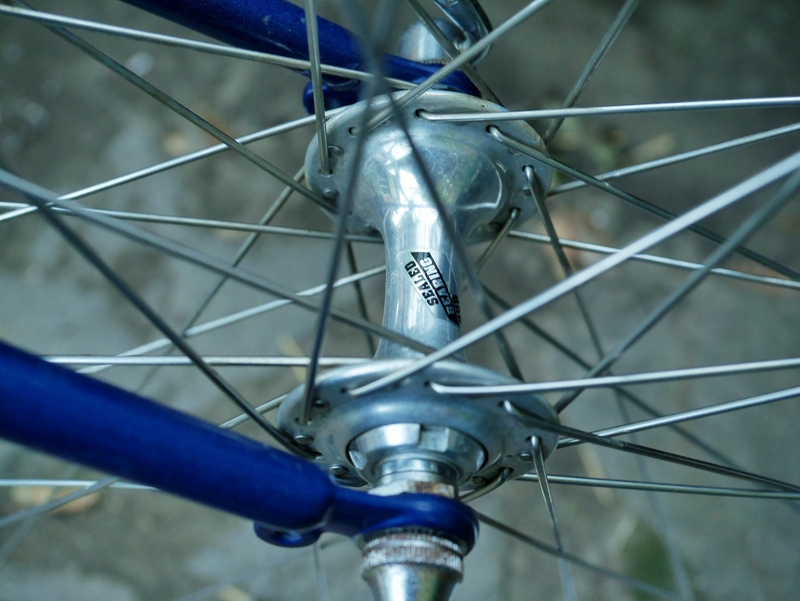 Japanese brands like Centurion, Nishiki, Bridgestone, Fuji, Miyata, Panasonic, and Univega were among the most well known manufacturers to build high quality touring bicycles. 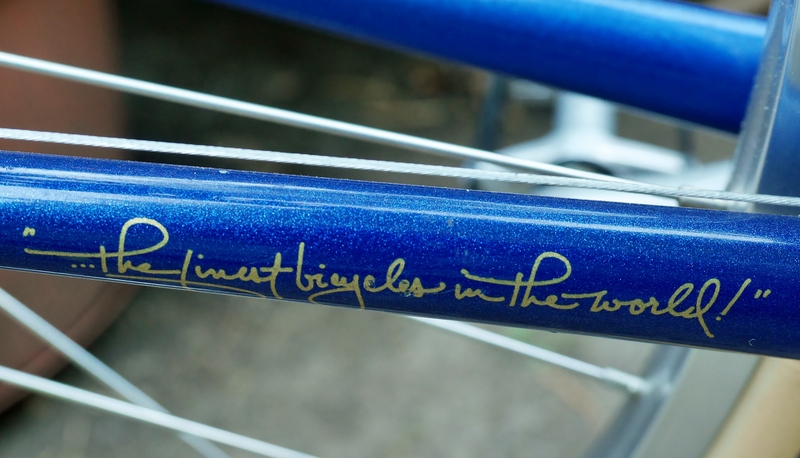 Raleigh, Peugeot, Trek, Specialized, Austro-Daimler, Gitane, Motobecane, Mercier, and others also joined in to build some of the nicest touring bikes ever mass produced. These touring bikes of the late 70’s and early 80’s hold a special place in my heart. Their excellent build quality and beautiful design represent freedom, exploration, and adventure. 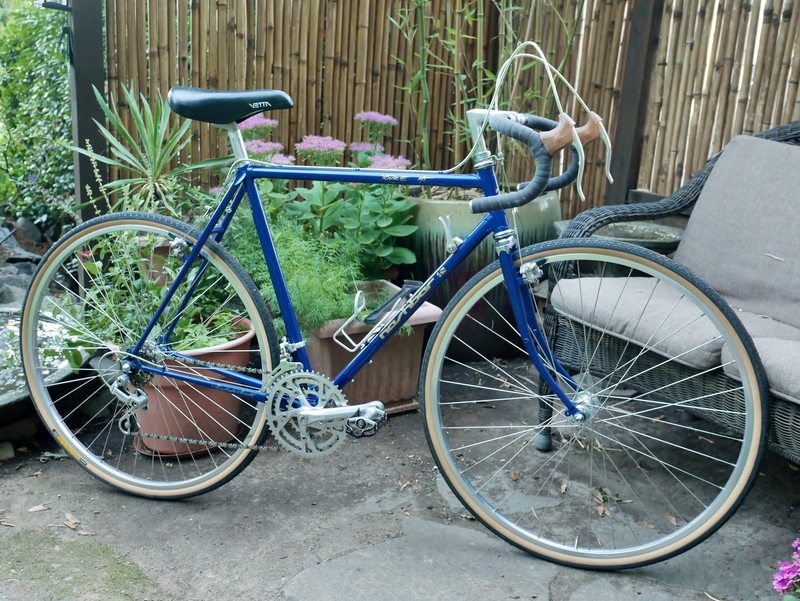 This lovely 1985 Nashbar Toure MT is a great example of the quality that could be had for a reasonable price. The frame was built for Nashbar by Maruishi – a Japanese builder not as well known as others, but still producing a beautifully brazed machine of double butted cro-mo steel. 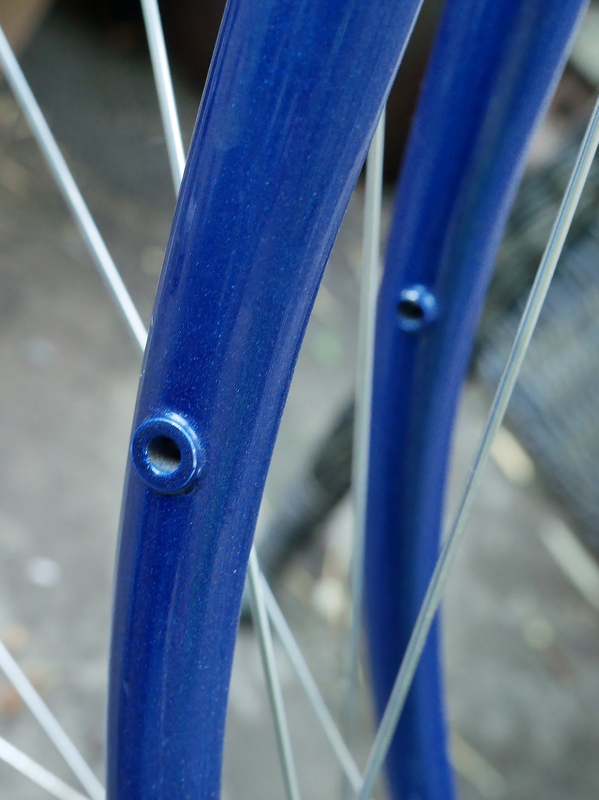 The gorgeous blue sparkle paint and well brazed seat cluster show off its quality. All the finish work is top notch. This is a bike I would keep for myself if it were my size. 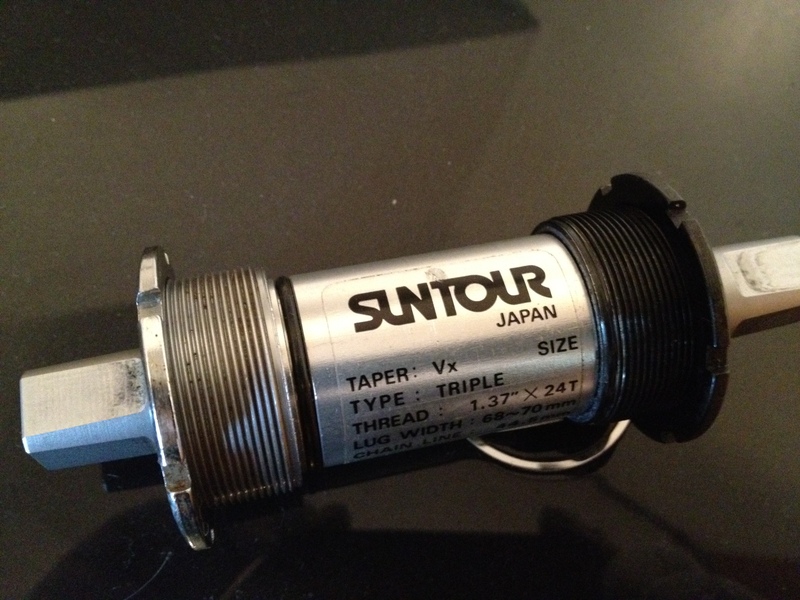 SunTour sealed cartridge bearing bottom bracket with chain line adjuster on the drive side. Sealed cartridge bearing hubs. No maintenance required. 2nd bottle cage mount underneath the downtube. 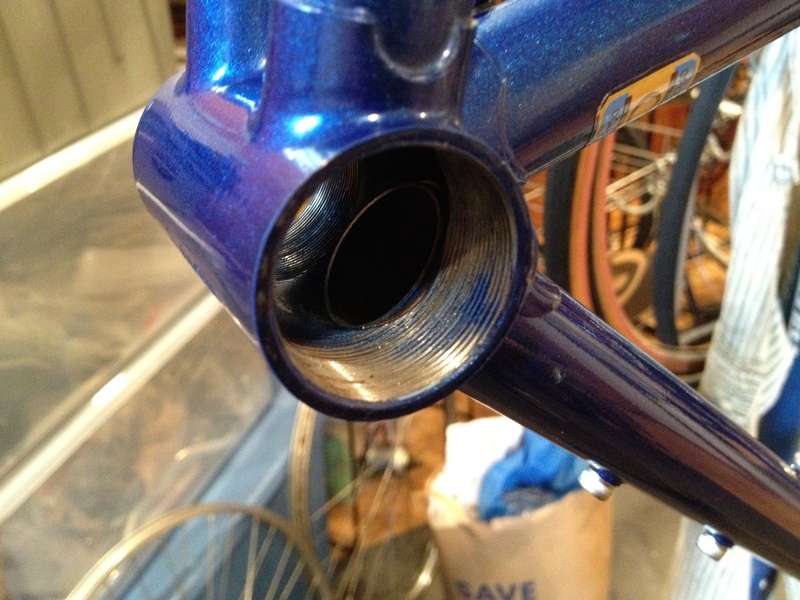 Seat tube has no bottle cage braze-ons – left clean for mounting a frame pump. There are so many nice features on this amazing bike that it’s hard to list them all. 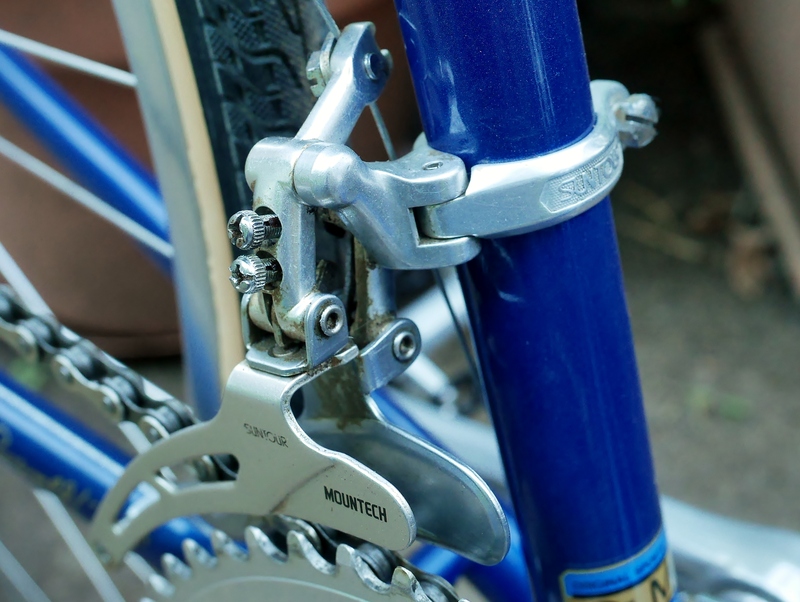 One reason that the bike is so pristine, however, is because long ago the SunTour Mountech rear derailleur had failed, and the bike was put away, thankfully in a dry, clean space. 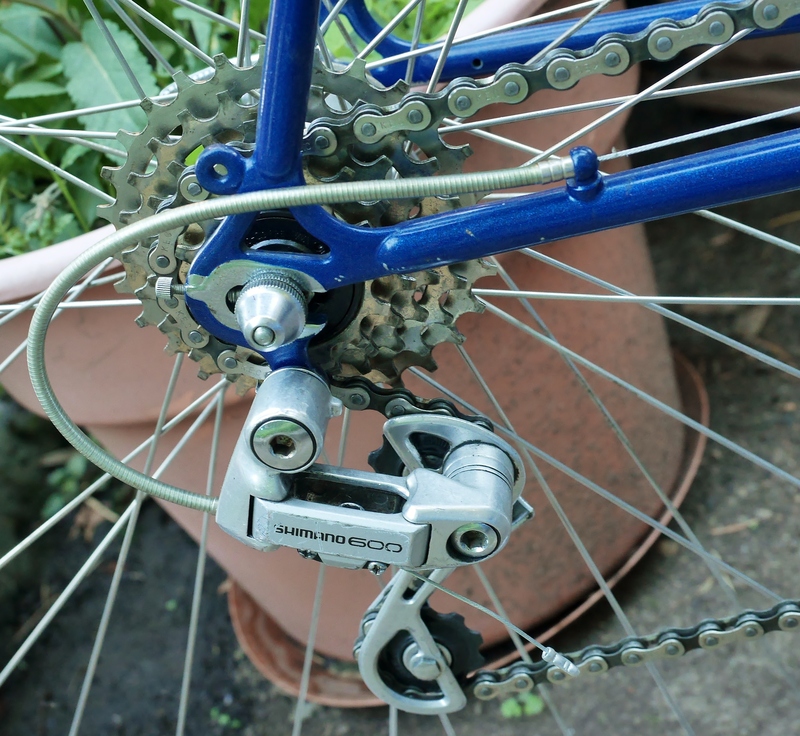 So, I replaced the rear derailleur with a Shimano 600 long cage mechanism from the same era. 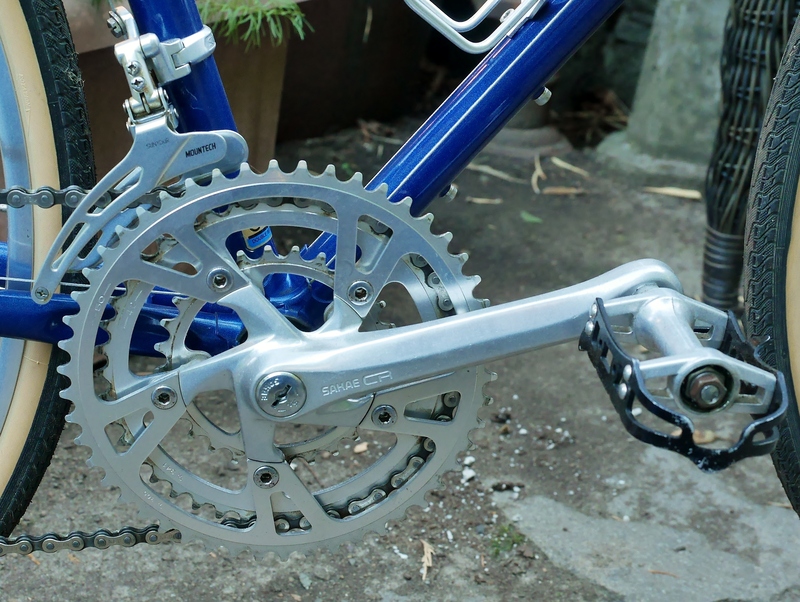 It works perfectly with the original 100% SunTour drivetrain. Triple crank with half step gearing. This bike was built in the days of gear shifting pattern obsession. 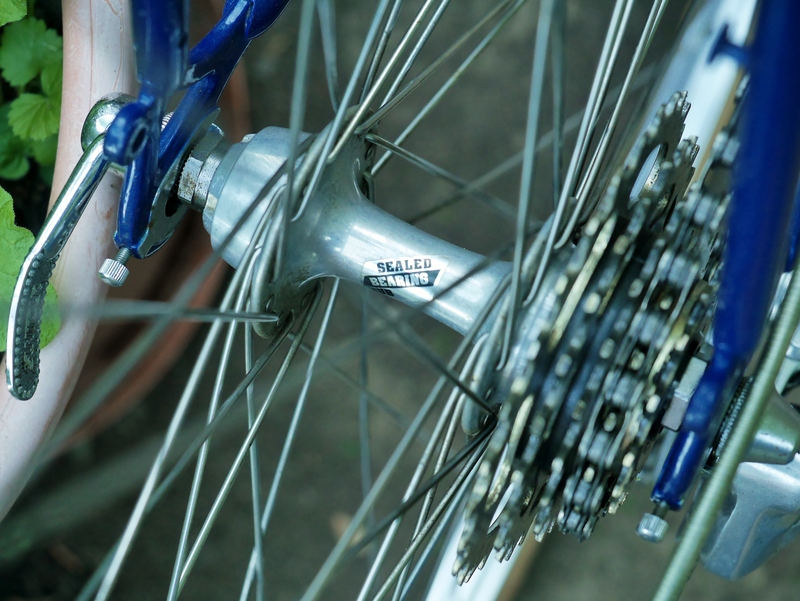 Half step gearing was a way to have a routine shifting pattern that would maintain cadence as the terrain changed. 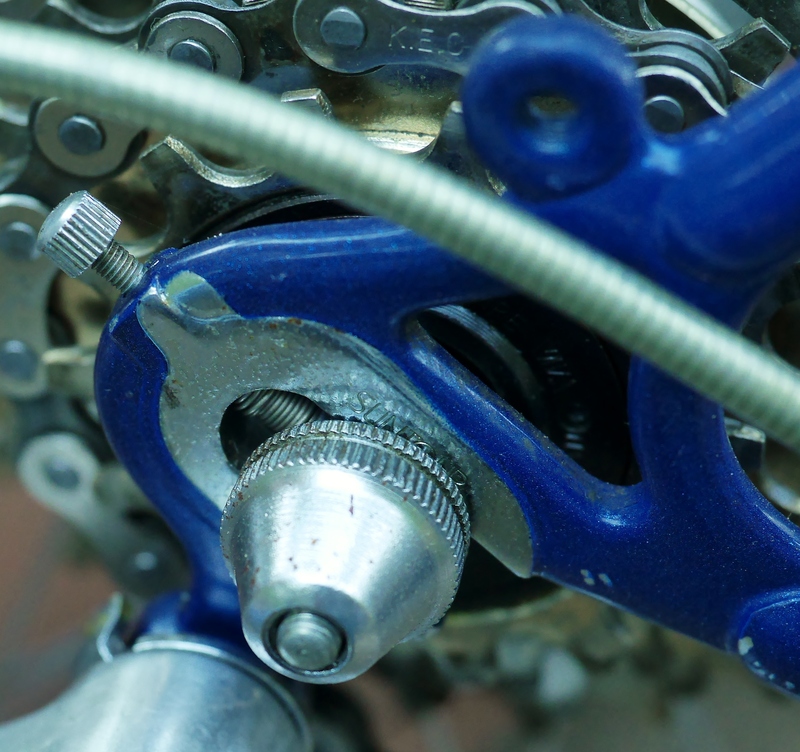 In practice, at least for me, I prefer not having to constantly double shift, so I am not enamored with half step gearing and have, when confronted with it, replaced the large middle chain ring with something smaller, such as a 40 or 42. 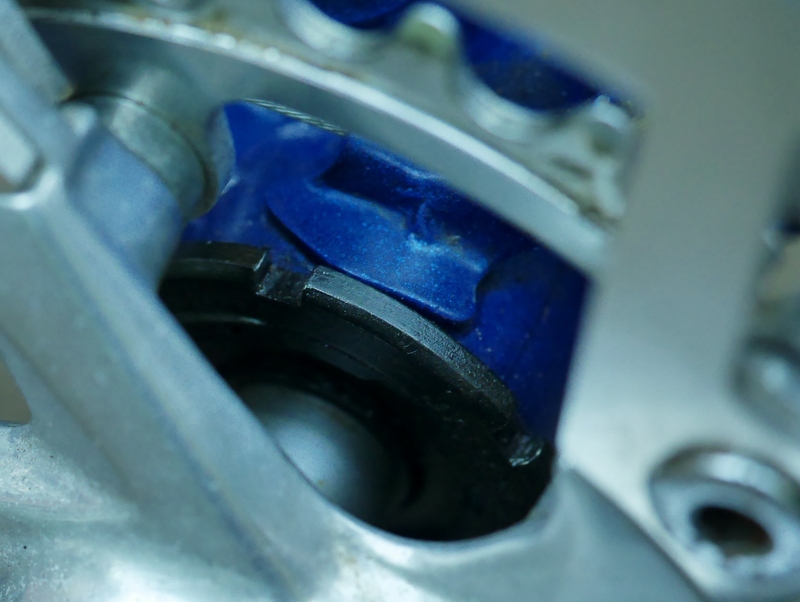 But, some riders love half-step gearing and more power to them (pun intended). 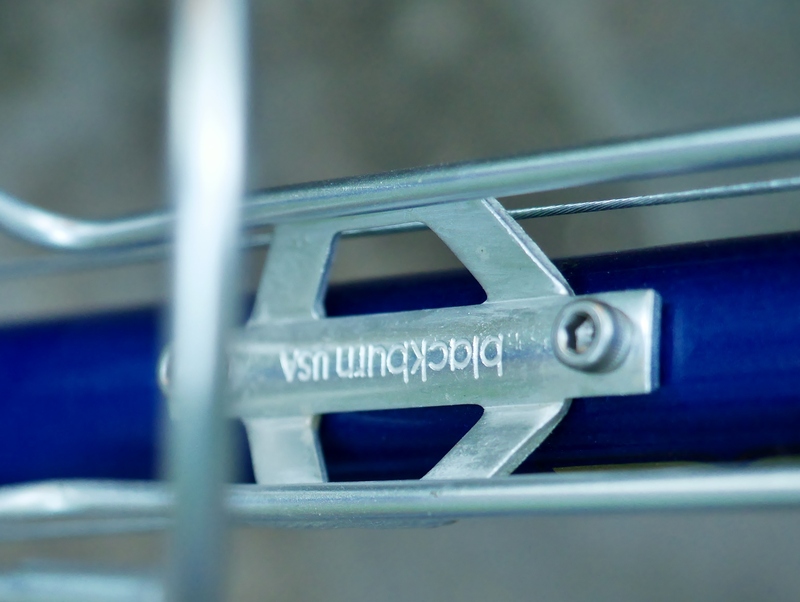 Nashbar logo on the downtube. Sealed cartridge bearing hubs, Suntour freewheel. 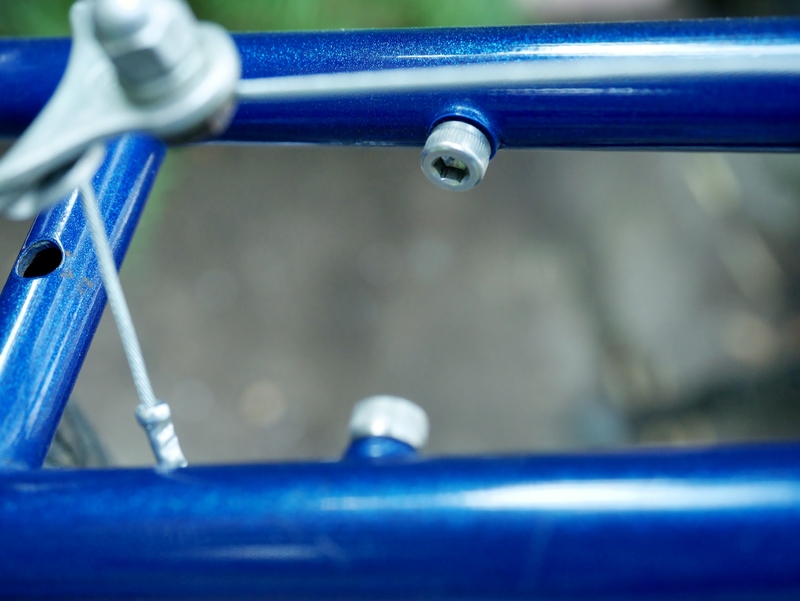 SunTour chromed forged dropouts with single eyelets on the rear. It would be tough to find a similarly engineered touring bike with these quality components, for a price that even remotely comes close to what you can buy this bike for now. One problem is that most cyclists associate Nashbar with low end liquidation components, rather than any kind of quality. But, back in the 1980’s, the arrival of the Nashbar mail order catalog was an exciting event. I ordered many wonderful and interesting components for my old 1976 Centurion from Nashbar back then. Today, however, the company is known for its discounted and discontinued parts, rather than for quality bicycles, for better or for worse. This wonderful old touring machine is going to a friend’s stable in Southern Oregon, where I know it will be ridden and appreciated. I hope to join him and his spouse on some wonderful rides through Southern Oregon wine country, and I will be a bit jealous his bike. This entry was posted in Bicycle restoration, cycling, Touring bicycle, Vintage bicycle, Vintage bicycle restoration, Vintage touring bicycle and tagged Bike Centennial, Nashbar Toure MT, Suntour Derailleurs, Suntour Dropouts, touring bicycle, Vintage steel bicycle, vintage touring bicycle by Nola Wilken. Bookmark the permalink. This bike is a beaut! I would love to see more bikes made like this again…. For someone who doesn’t care much about having a flashy brand, this Nashbar is nothing short of an incredible “sleeper” (same with a few other brands from the 80’s, such as KHS and Kuwahara) featuring such incredibly rich features pointed out by Nola (Paint, construction, components, features). Very nice feature spot for the Nashbar, Nola. Finally the respect it deserves. Great bicycle! It is a true sleeper bike! Very few cyclists would discern its quality. 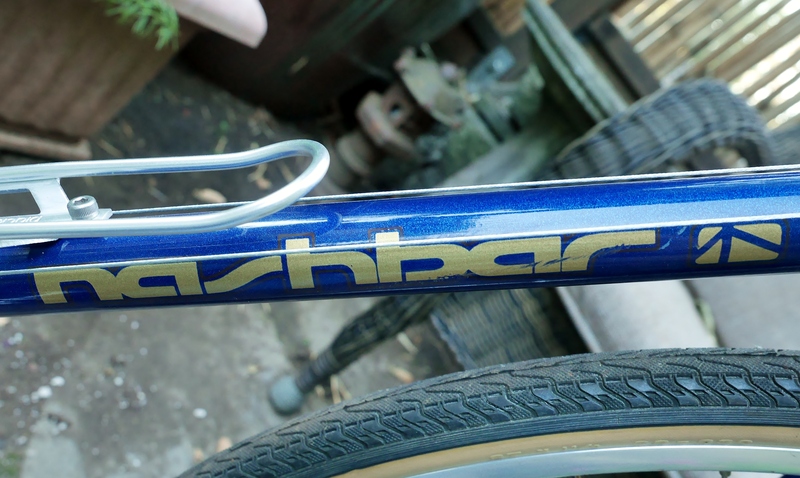 It’s too bad that the Nashbar brand was devalued, because during this era the company, originally know as Bike Warehouse, carried the nicest frames, components and bikes of the era. Lucky you in the States as strangely enough, the availibility of mid market or good value touring bikes from that era in France is limited – Peugs and Motobecane are to be found but IMHO the parts mounted on these bikes were not as good quality as for the japanese examples – Simplex delrin derailleurs don’t match Suntour ones ! 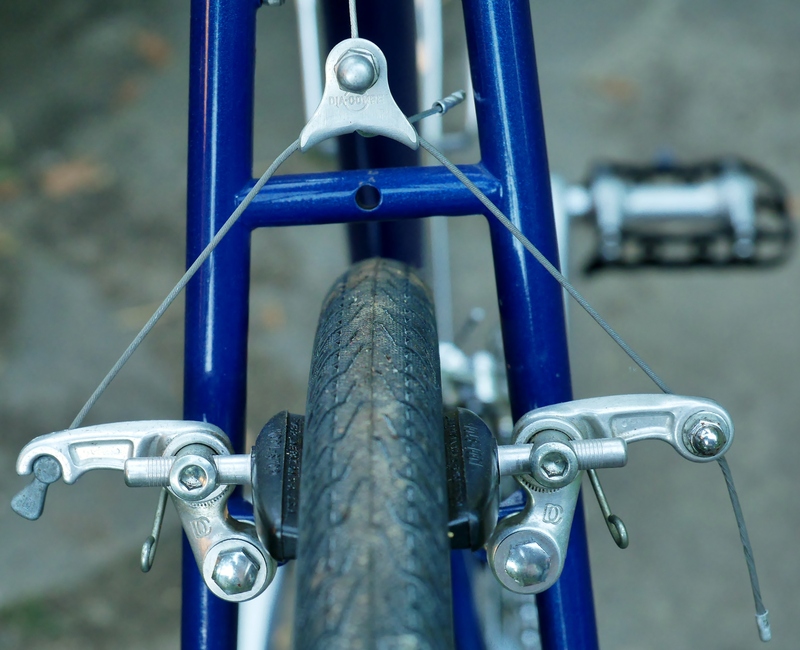 and cantilevers brakes are very seldon seen for french examples, Mafac centerpull brakes being the habit. Finally , apart from a few Motobecane in Vitus 172, I find the tubing for french examples was not as sophisticated as the japanese comparable frames ! Hi Bruno, you share an interesting perspective. 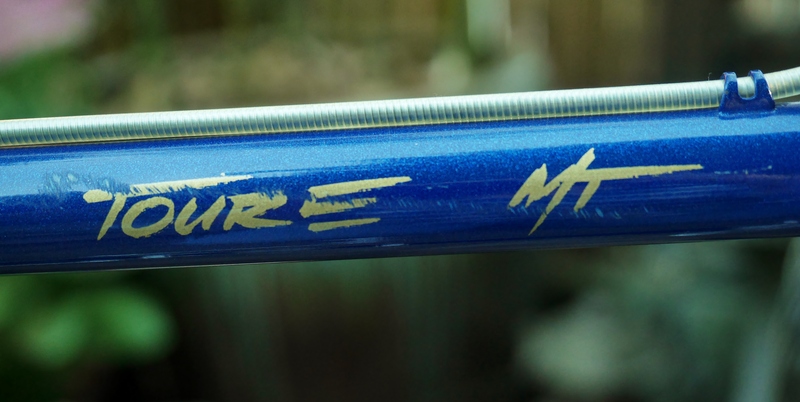 I would agree that Japanese manufacturers in the 70’s and 80’s were superior to their French and British counterparts, not only with regard to component quality, but also in the quality of the frame brazing and painting. Unfortunately, Raleigh frames really suffered during this era. 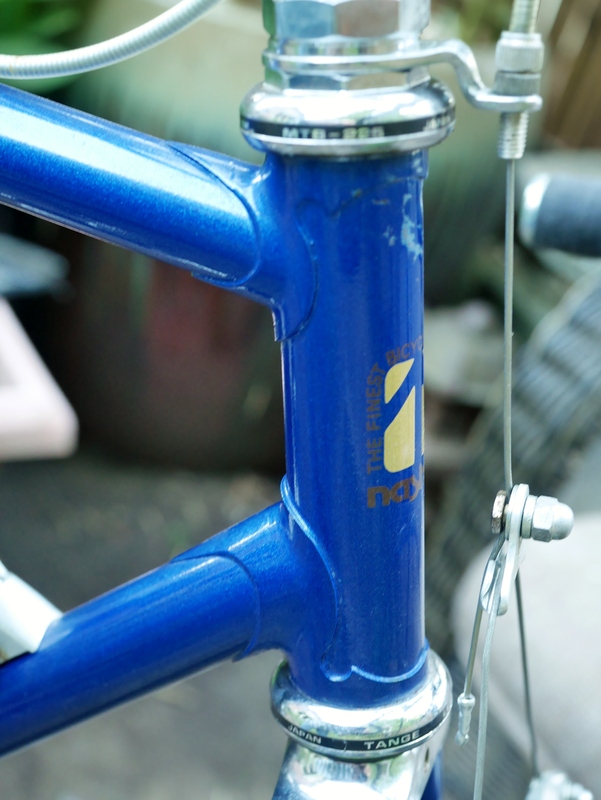 In my own experience, French frames of the 70’s and 80’s are a mixed bag, and the quality often depends on the particular model, with some of the lower end models having very sketchy brazing, poor paint quality, and bad finish work. But, there are still some very nice French frames built at this time. 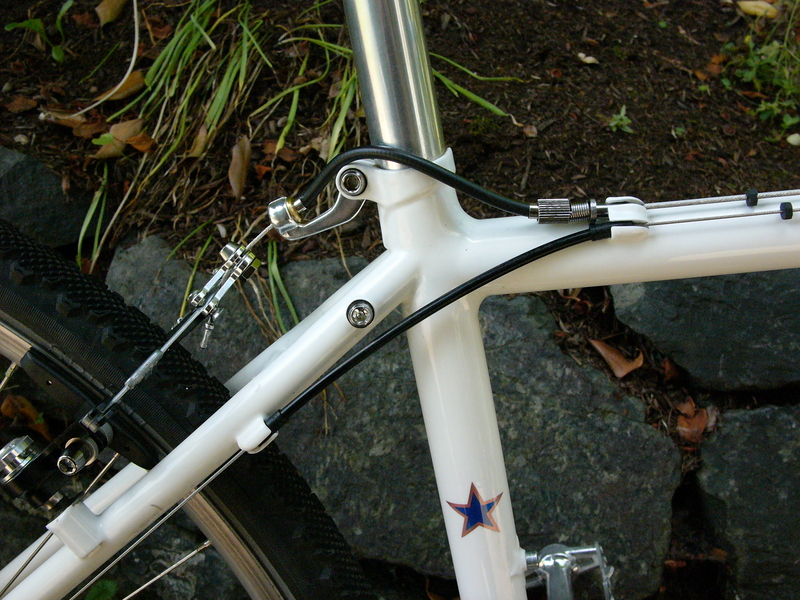 Your comment about centerpulls on French bikes vs. cantilevers on Japanese frames is also something to take note of. 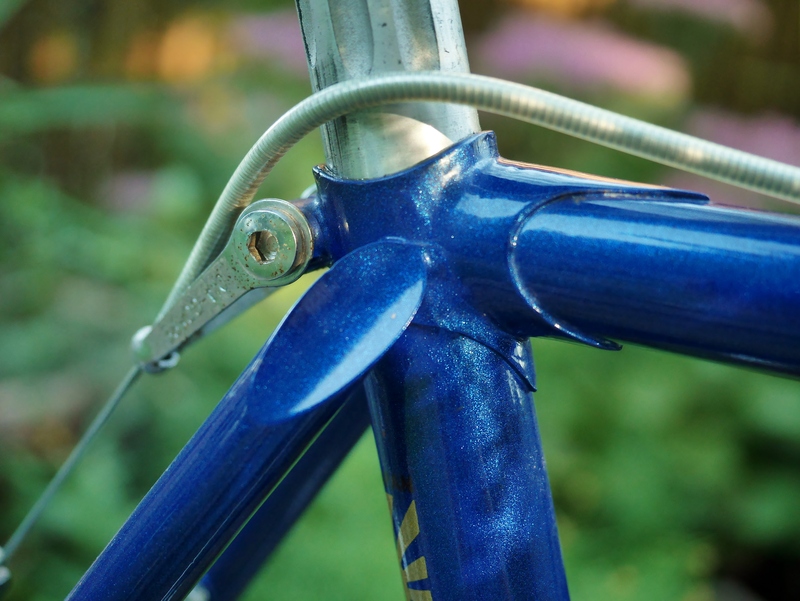 While I have often seen Mafac cantis on French and Brit bikes from earlier eras, you are right that often you only see centerpull brakes for the 70’s and 80’s models. And, the decline of Simplex into plastic was sad. Earlier Simplex components are magnificent! As you say welding quality is disappointing on most models. High end bikes can be sourced but quite often they are light randonneuse in 700C and generally do not accomodate bigger tyres than 25. And a lot don’t have canti bosses. 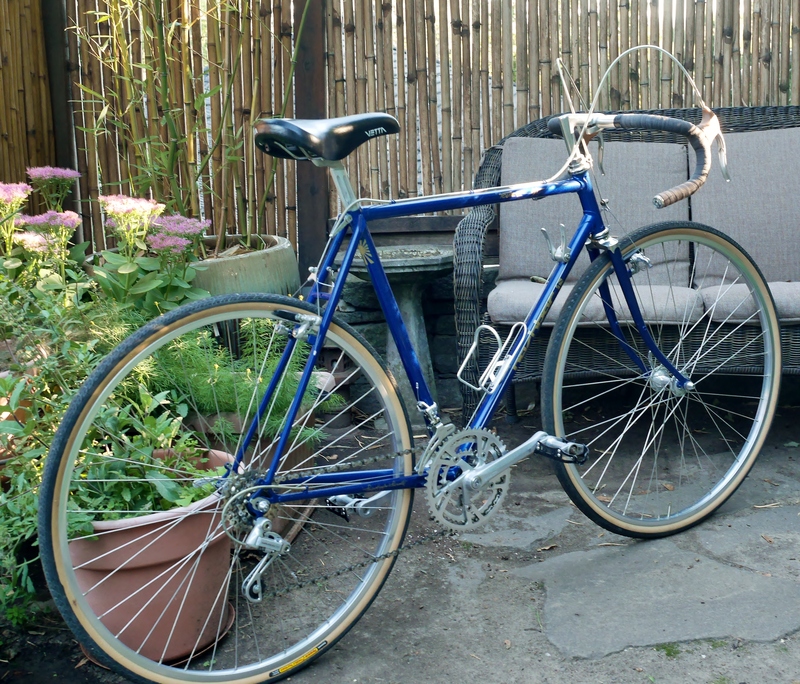 I have been looking for a bike such as a Centurion Pro Tour or a Bridgestone RB T but they are not to be found in Europe and having shipped them from the States is impossible or ludicrously expensive 😦 So for the moment I console myself with restoring higher end machines such as Routens or Narcisse but for a everyday bike , its a bit over the top ! So For the moment I converted a titanium MTB russian frame from the 90’s with modified cantis to take 700 wheels but I can’t have fenders or any rack ! I like how the shifters are mounted above the downtube. I had never seen that before. I can imagine that it is welcome when your shoulders get really sore later in the ride. Seattube is a decent place to mount your Counter Assault if you store a mini-pump. Yes, but the downside to these shifters is that they sit on a Suntour proprietary boss brazed to the frame, so it can be difficult to modify the shifters in case you want to move them up to the handlebar. I do find that sometimes downtube shifters can be fatiguing to use, so this design helps by placing them just a bit higher. Thanks for sharing your nice find. That’s a great bike you have! 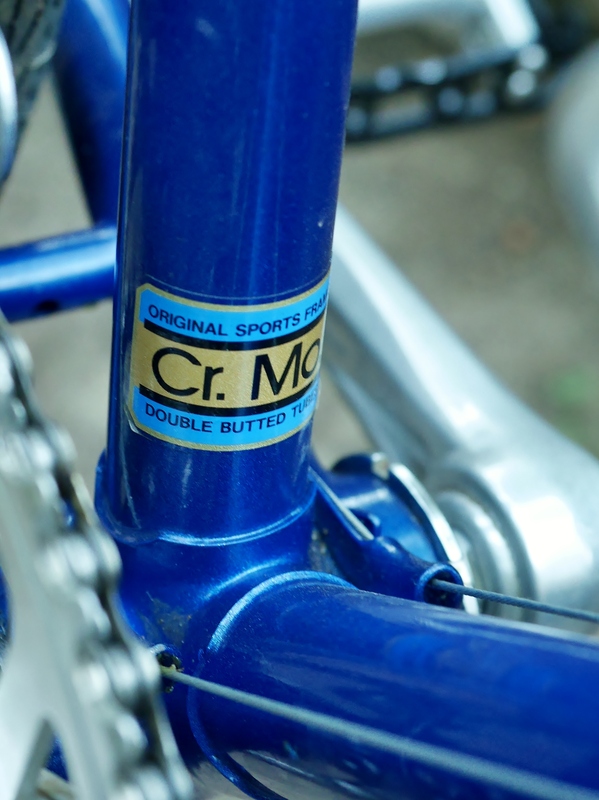 The value in these older quality frames and components is simply incomparable to today’s production bikes. Amazing condition and super clean. Looks great. This article reminds me of a similar bicycle sold in Canada in the 1980’s by Velo Sport, and i believe also made in Japan. One of my roommates in the late 1980’s had a silver one and went on an extended camping tour with it. The bike had brazed-on cantilever brakes, 18 gears and braze-on fittings for front and rear racks, water bottle cages and so-on. IIRC it cost him over $600 back then. Fast-forward to about ten years ago, and I found an almost identical bike(but in light blue), left by the curb for trash pickup about a block from my house. Unbelievable. The owner was nowhere to be found, and with scrap metal scavengers often prowling the neighbourhood, the bike ended up in my garage in a hurry. A clean and a lube, new tires and cables, and I had a great bike for several years until I could no longer ride comfortably with that frame geometry and riding position. I sold the bike to a local “recycling” store, from which I’m sure it found a good home. Hi Patrick – what a great story. I hadn’t heard of these bikes before but it sounds like they were very similar to the other top tour bikes of this era. There is so much value in these nice old touring bikes! 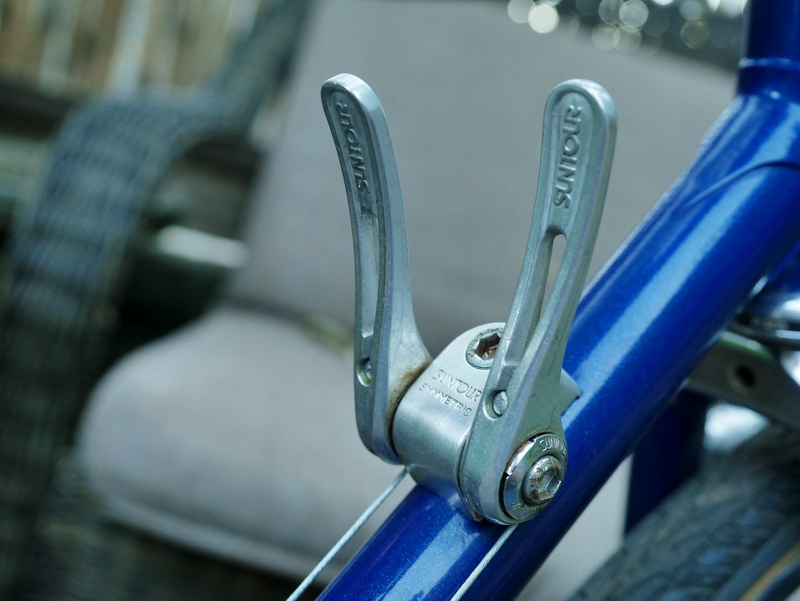 what a lovely old school tourer, great post, I am working on a 1986 Schwinn Passage which I am fairly certain was built by Panasonic during the “Schwinn Approved” period. I also have no love for the half step gears and went instead with a 46/36/26 set up on the Sakae cranks. 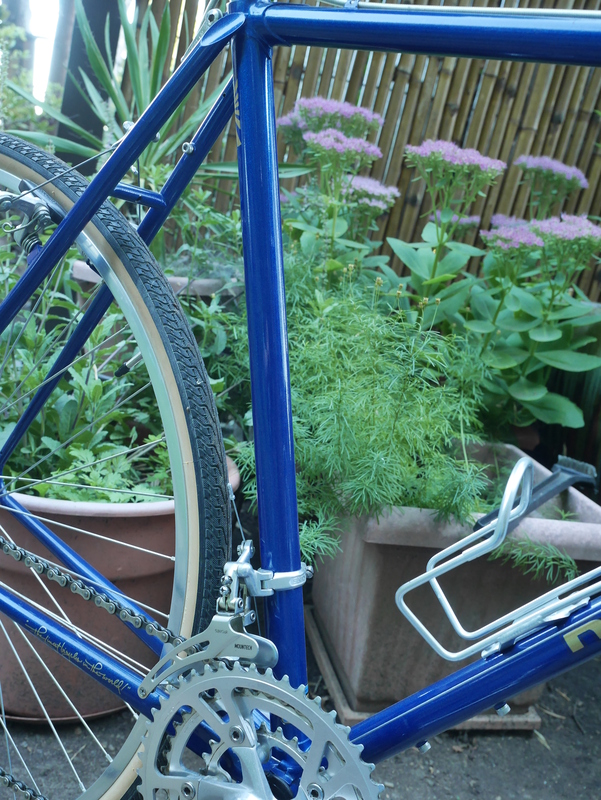 Thanks – the Schwinn Passage is yet another example of an excellent production built touring bike from the 80’s. And, of course, many Panasonic models are top notch as well. These 70’s – 80’s touring bikes are versatile and can be adapted to many different styles of riding. I have an old Fuji touring series iii that I love, and use for commuting and errands. I was thinking of changing the front derailleur from a Suntour Mountech to a Suntour Cyclone. Good or bad idea? If the Mountech is failing – the Cyclone might be a fine replacement. Hello Eric, I don’t have experience with the brand of tandem you have described. 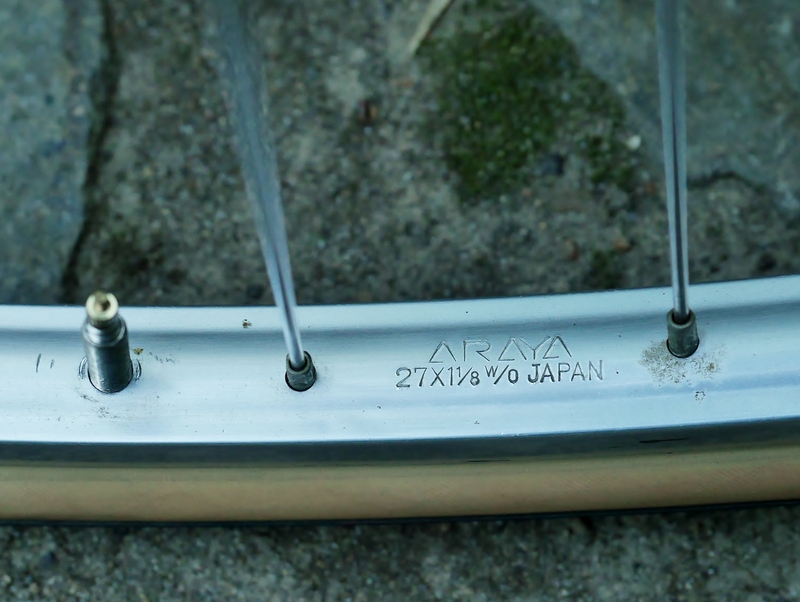 There may be Japanese language vintage bicycle forums which could be helpful. If you use a translate tool, you can read the content without speaking Japanese, although most translate tools are imperfect to a certain degree. Let me know what you find out, and feel free to add a photo or two to your comments here, or a link. Thanks. 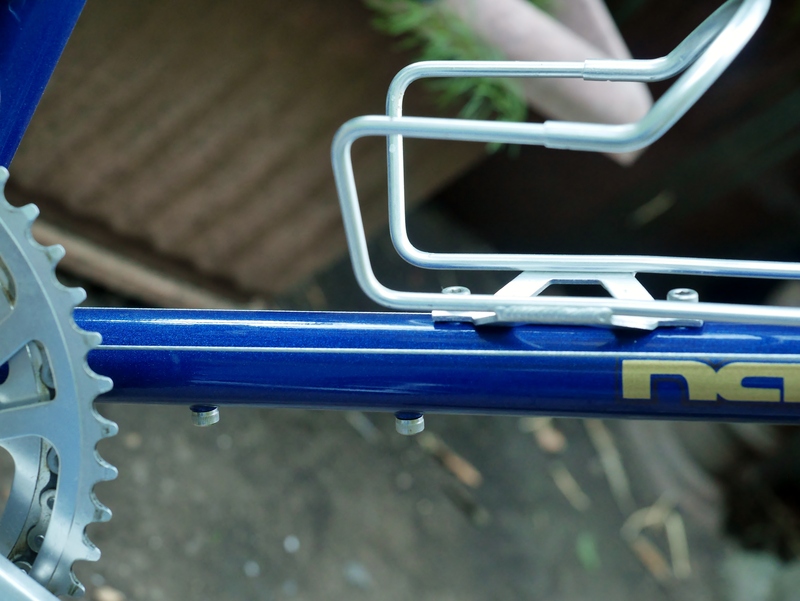 I just came across your wonderful blog, since I recently bought almost exactly this model and year of Nashbar touring bike with all its original components. It’s the first bike I’ve owned with center-pull calipers, and I find it devilishly difficult to get the rear set up correctly — since there’s no barrel adjuster anywhere in the system! Do you have any tips or tricks for how to 1) make small adjustments in the rear brake, and 2) pull off the rear wheel without detaching the cable? Thank you for all the love you put into this blog, I am really enjoying reading your articles. As to setting up cantilevers, that is definitely an art form. I think Sheldon Brown’s guidance is probably the best online resource. It is tempting to set the pads very close to the rims, and that can make it difficult to get the quick release straddle cable back on again. That’s where a barrel adjuster can come in handy. Congrats on your nice touring bike – hope you enjoy it!